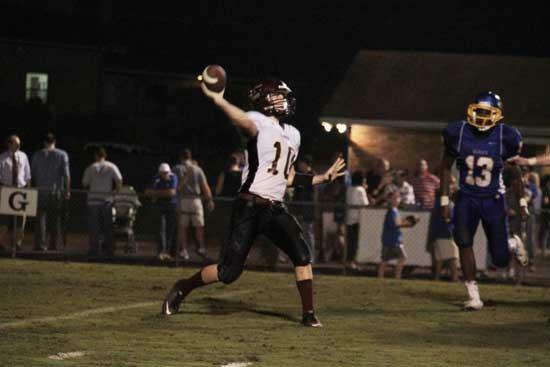 HERMITAGE - On paper - and the scoreboard - Cannon County's most recent gridiron encounter resulted in another disappointing outcome, but there was evident progress despite a 44-6 loss at DCA Friday night. The Lions (0-4) played turnover-free football for the first time this season. Senior tailback Gabe Walkup surpassed the century mark for the second time with a season-high 122 yards on 23 carries, including his 7-yard touchdown run. Senior quarterback Heath Simons was poised in the pocket and targeted eight different players for his 11 completions. "I think we came out of this game with some things to be positive about," Walkup said. "We moved the ball on offense but just came up short on some drives. We didn't have any turnovers and that was something we have really concentrated on this week. We had some success running the ball, and I thought our offensive line did a real good job so there were some bright spots." Hidden behind the score were positives Cannon County will hope to build on as they prepare to go back into District 8-AA play at York Institute, Sept. 17. "There have been bright spots in all of the losses," Cannon County Head Football Coach Joel Schrenk said. "We're correcting things that need to be corrected and making good plays, but we have to put more than a few good players together. We have to put a quarter together, and then a half and so on." Cannon County scored its only touchdown when Walkup capped a admirable nine-play, 80-yard drive as he blasted in from 7 yards out in the fourth quarter. Simons completed two crucial passes on the drive - a nifty 17-yarder to Jordan Linder on a crossing route, and a dazzling 9-yard completion to Brandon James while avoiding pressure. Otherwise, Walkup and the Cannon County offensive line dominated the line of scrimmage as the powerful back churned out 28 tough yards before his clinching run. Another positive was clear on the scoring drive with young players siezing opportunities. Freshman Hawk Love was the lead blocker on Walkup's scoring run. Three sophomores - Zach Osborne, Ryan McLaurine and Dakotha Mills - were manning the offensive line. Not only did James, a sophomore, come up with a key reception on the scoring drive, but he also enjoyed his most extensive playing time after suffering a preseason injury. He supplied excellent blocking from his receiver position while also providing good coverage defensively, preventing one touchdown on a deflection in the end zone and recovering a fumble that was forced by teammate Daniel Northcutt. "It felt good to be back out there playing and trying to contribute to the team," James said. "It was a blast getting back out there and playing. I'm just trying to get better and do whatever I can to help the team because we are going to get this turned around." Several other young players saw extended action for the Lions and drew praise from Schrenk. In addition to Love, Mills and James, Waylon Sedtal, Dalton Ryan and L.J. Lulow also made the most of their time. "Brandon is healthier and he played well and he played hard tonight," Schrenk said. "He showed signs of some of the things he is capable of doing; things that can really help our football team. We tried to get some of the young kids in the game and gain some experience and some of them really played well. I was proud of them." Unfortunately, for Cannon County, early damage once again doomed their chances of securing the elusive first win of the season. The Lions surrendered 27 first-quarter points as special teams breakdowns in the punting game gave DCA (2-1) possession inside the Lions 30 twice in the first quarter. Both miscues were turned into touchdowns as part of the first-quarter onslaught. DCA scored on its first five possessions before Northcutt's forced fumble was recovered by James midway through the second quarter. "We just have breakdowns here or there and when we do it is Murphy's Law because they always seem to be running to where we break down and they are out the gate," Schrenk said. "We did a better job tackling tonight but the breakdowns and punting miscues put our defense in a tough situation in that first quarter." After the dust had settled following the first quarter, Cannon County settled in and competed well over the final three quarters. In fact, the second half was 10-6 in DCA's favor. Cannon County will try to build on the positives of Friday's setback as they prepare for the upcoming league match-up at York. Cannon County Statistics - Passing: Heath Simons 11-23-0 81; Colin Jones 0-1-0 0. Rushing: Gabe Walkup 23-122, Simons 2-6, Collette 2-1-0. Receiving: Linder 3-32, Collette 2-11, James 1-9, Weaver 1-9, Love 1-7, Walkup 1-5, Jones 1-5, Tobin 1-6. This article is a little misleading of the game. Most of the 2nd quarter, the Second and Third teams were in for DCA on offense and defense. It looked to me the starters had one drive in third quarter before playing the reserves the rest of the game.